Burnwork, brass studs, feather, brass inlay, aged , trade beads, various other beads, clay paint, hide gliue, etc. Complete, elaborate silver & brass inlaid presentation models, which were brought to Indian leaders as gifts and manufactured for the Indian trade. 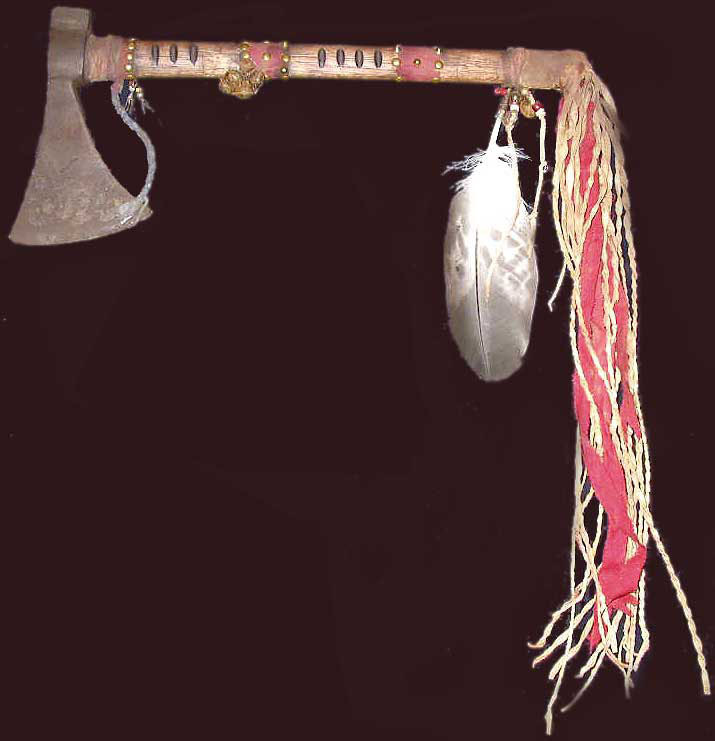 Each nation producing tomahawk heads used their own patterns and markings. 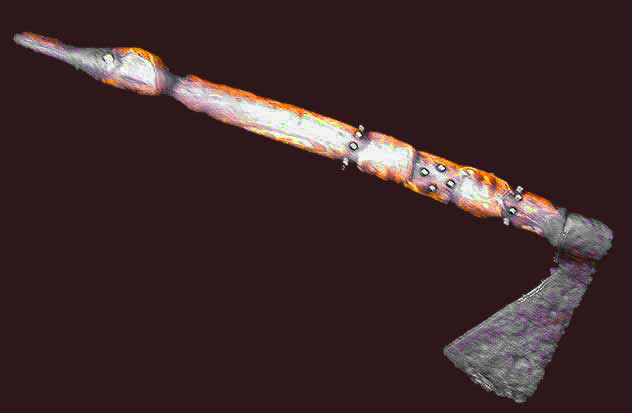 The English blade resembled a straight ax, the French was shaped like a fleur-de-lis, and the Spanish was in the shape of a broadax. 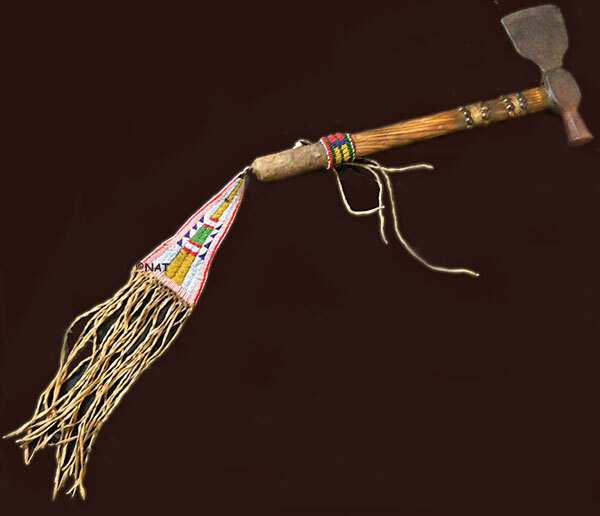 However, it was the Indian artisans who gave the tomahawk its crowning glory with his beaded, carved, fur-covered, and painted handles, and stately beaded tabs and appendages, which were in perfect proportion and attached to the handle ends. Old axe head, handle with brass wire and tacks near head. Bison handle wrapping, beads and red stroud cloth. Twisted strap runs through handle. Twisted fringe on beaded pendant drop. 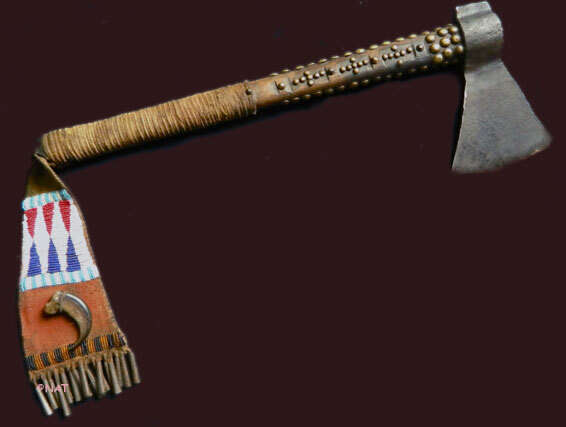 This tomahawk features a very old (antique) axe head To compliment this feature a beautiful haft has been carved featuring a goose. It has also been also and polished with natural oil and clay paint s.. 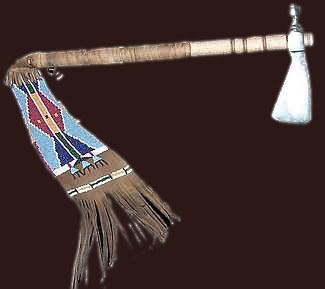 The haft is based on a museum replica with the same similar axe head. Lovely wood grain! 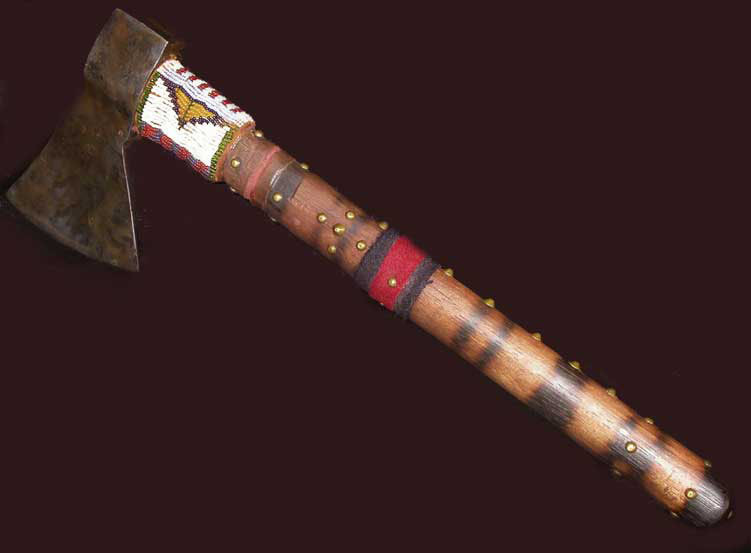 This tomahawk features an old tomahawk head. The haft is new but aged to compliment the head. It features brass studs, twisted fringe, calico ribbons colored with clay paints, hawk bells, deer hide, feather, braided leather, old trade beads from the 1800's, etc.